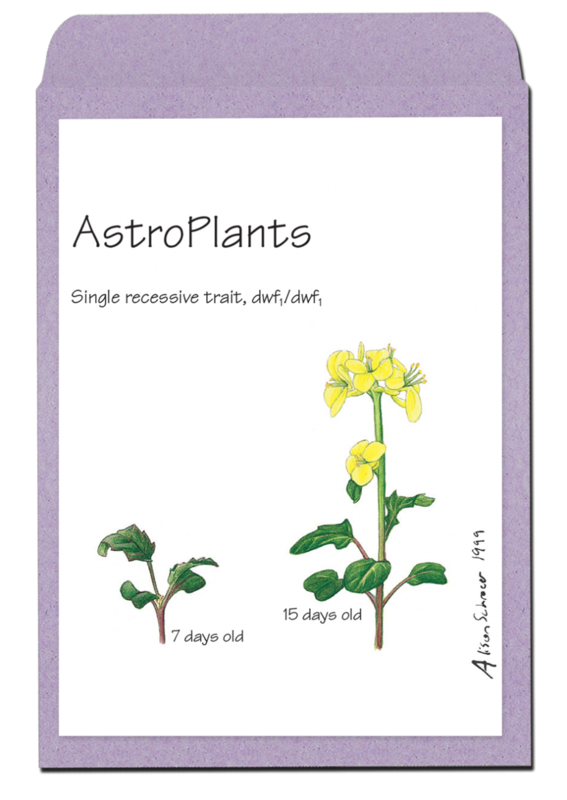 AstroPlant variety of Wisconsin Fast Plants® was developed over the past 17 years through a long-term artificial selection plant-breeding program at the University of Wisconsin – Madison. This variety was initially selected from a Petite variety population with a focus on selecting for a very specific criteria: 5 flowers at 15 days and less than 10cm tall. The AstroPlant variety was used on many Space Shuttle missions and the International Space Station for research on how plants grow and reproduce in space. This research provided foundational data for further research into food production during longterm space travel. AstroPlants are shorter and more compact than Standard and Petite. As a result of the extensive selective breeding conducted to produce AstroPlants out of the Petite variety, this variety tends to be more susceptible to environmental variables than Standard Fast Plants. These plants are not considered genetically modified organisms (GMO). Their closest vegetable relative is a turnip or Chinese cabbage.